Registration is required to participate in these meditation sessions. When you register for the full series of meditation sessions, you gain access to all available meditation sessions of the 2019 series, Meditation Sessions via Audio Stream 2019. Access to the full series expires one year after registration. The meditation sessions are being held via audio stream in English and become available as webcasts in English a few hours after the audio stream ends the same day. A few weeks after the audio stream, the webcast will be available in Hindi. Every session in the webcast is structured in chapters, and you will be able to either play the whole webcast or select any chapter within it. Please use up-to-date versions of the browsers Firefox or Google Chrome to participate in the audio streams and the webcasts. It is not recommended to use the Safari browser since in some cases the audio gets muted during the audio streams. How do I prepare for a meditation sessions? Prepare for a meditation session of this series by engaging with Gurumayi's Message for 2019, which is on the Siddha Yoga path website. Click on a Commune with Nature video to test if you can successfully launch a webcast with sound. If you cannot successfully launch a Commune with Nature video with sound, please contact ebookstore@chitshakti.org at least two days in advance of the audio stream for further support. Send an e-mail to ebookstore@chitshakti.org. There are a total of 9 meditation sessions in this series, with one session every month until September 2019. Each meditation session is approximately 45-60 minutes in length. For how long will each meditation session be available? For each webcast, registration will be available until at least Monday, December 31, 2019. Once registered for a session, you will be able to participate in that session as often as you wish for one year after registration. For example, if you register for Session I, on January 26, 2019 at 7:00 p.m. then, the audio webcast for Session I will be available for you to participate in until 11:59 p.m., January 26, 2020. The audio audio stream will be in English. The audio webcast in English will become available on the day of the audio stream. The translated webcasts in Hindi will be made available on the Siddha Yoga path India website a few weeks after each meditation session concludes. You can register to participate on line for the full series. Registering for the full series gives you unlimited access to all available meditation sessions for one year following registration. You can register to participate online for each session individually. The purchase of a session grants you access to that session for one year after registration. Participate online via audio audio stream or audio webcast or at a participating Siddha Yoga meditation centre or chanting and meditation centre. Does online registration allow participation at a location? Yes if the participant provides proof (e.g. a copy of their confirmation e-mail) of their online registration for the respective session. How do I register to participate at a location? Contact the Siddha Yoga meditation centre or chanting and meditation centre where you wish to participate. At what time will the audio stream of the meditation session begin? The audio stream will begin at 10:00 a.m., New York time with entry music starting to stream at 9:30 a.m., New York time. At what time will the audio webcast for a meditation session become available? The audio webcast in English will become available the same day after the audio stream concludes. Can I invite friends to participate in the audio stream or audio webcast in my home? Can I participate in the audio stream or audio webcast on a different computer from the one I registered on? To launch the meditation session, visit the participation page (HERE) in the mini site for 2019 Meditation Sessions, click on the session button that you wish to participate in on the page, and sign in with the same username and password that you have been provided with. Is there a recommended browser for the audio audio stream and audio webcast? Please avoid using Safari, as in some cases the sound for the audio stream is muted. Is there a recommended Internet speed for participating in the audio stream? The minimum recommended internet speed is 4 Mbps. For lower internet speeds, you will be able to participate with lower video resolution, though you may experience pauses or breakup of the stream. To change the visual quality of the media player, click on the settings icon in the lower right corner of the player (see screenshot). 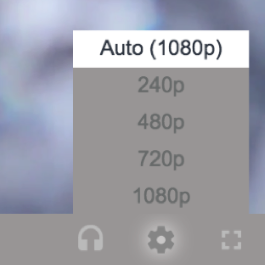 A dropdown showing your current visual quality and other resolutions (240p, 480p, 720p, 1080p) will appear. Choose a higher resolution if the still images are flickering and choose a lower quality if the stream does not load properly. The quality selection only influences the visual quality; the audio quality is the same for all settings. See the images below of the audio stream and audio webcast players. The illustrations for the audio stream and audio webcast players look slightly different. During the audio stream, if the video is still buffering or pausing too often, you may switch to audio only. To do so, click the headphones icon in the lower right corner of the player (see screenshot). To switch back to video from audio only, click the settings icon in the lower right corner of the screen. Can I pause and rewind the audio stream and audio webcast? You will not be able to pause or rewind the audio stream. You will, however, be able to pause, rewind and replay the audio webcast, once it becomes available after the audio stream concludes.